Can you find a bottle of wine by a vintner skilled at making good vino from disparate places like Temecula, Lodi and California’s central coast? We found that vintner, right in our backyard, that can blend great bottles of wine from dissimilar grapes. And, he’s here in Orange County. 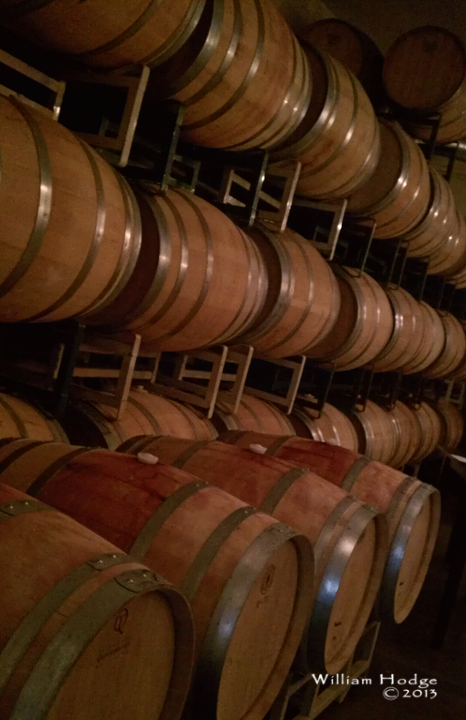 Orange Coast Cellars is related to Temecula’s Wiens Cellars and sources grape from their vineyards, along with grape from Lodi and the central coast of California. We’ve promised to explore local wineries (i.e. Southern California in the Los Angeles basin) so we decided to visit and see what they had to offer. While Southern California lacks the vine covered rolling hills of Paso Robles and Santa Barbara, good wine is creeping into this area. Winemakers who enjoy Southern California, it’s sunshine, surf and mountains are bringing in grape and blending tasty wine. There’s a school of thought preaching that terrior (the ground, the earth) will make or break a wine. The best wines come from the best dirt. But I think this is a disservice to the winemaker, the winemaker with a palete that sings for you. I often think that we’re not so much looking for a good winery, or good terrior, we’re looking for a winemaker who likes the same kind of wine we enjoy, because they’ll seek out the grapes from the terrior producing a bottle of wine they enjoy, and thusly, that we enjoy. Orange Coast Winery is an example, as they source wine from throughout the state, including Temecula, a local part of our journey many years ago. We visited Temecula 10 years ago and found the wine to be, well, let’s just say it wasn’t ready for prime time. On top of that, being surrounded by large metropolitan areas (San Diego, San Bernardino and Los Angeles) we thought the wines were too pricey, their price to taste ratio was too wide, too expensive. 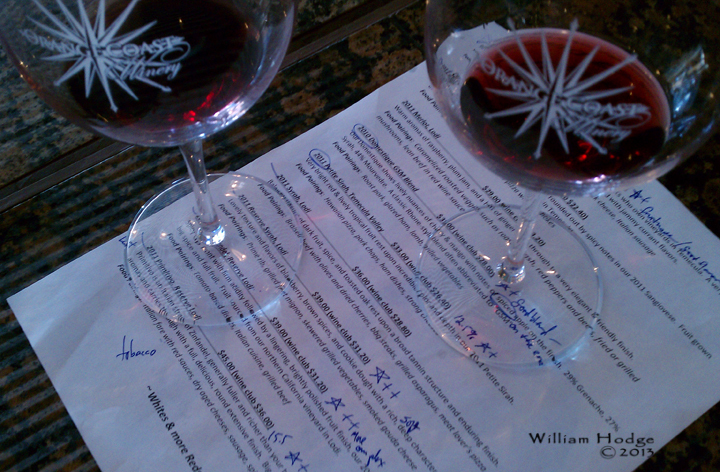 So when arriving at Orange Coast’s tasting room we were reluctant to taste anything from Temecula. We started hunting for Lodi and central California bottles of wine. Our host, being smart and gracious, said the right thing, “You owe it to yourself to try some of these wines, they won’t be part of your tasting [expense.] I want you to try them.” So we did taste wine from Temecula, and gave them good marks. Yes, we do think the prices are a little high, but we thought the wine was very good. We are used to purchasing an outstanding bottle of wine from Justin or Denner in the mid-$40 range. 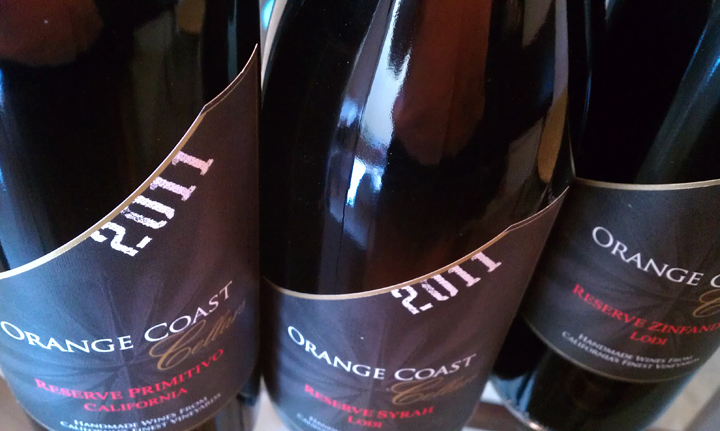 With Orange Coast, $45 for a Primitivo seems high. Club price for this wine is $36. Their wine club is distinctive, notably in their flexibility. If you are picking up your wine (which we will, because the tasting room is in our backyard) you may taste the wines in your shipment before accepting them. If you prefer another wine you can substitute, using the dollar value as a currency to buy another bottle of wine. Some of their wine is available at Total Wine according to the hosts. They believed that Orange Bubbly and their 2012 Sauvignon Blanc were available retail. We found their Sauvignon Blanc, Beach Blend Red and Temecula Valley Zin listed on Total Wine’s web site, for prices similar to the tasting room’s pricing. They’re located in the industrial zone at 869 West 16th Street, Costa Mesa (they say Newport Beach) near McGregor Boats’ manufacturing facility. A tasting is $15. And being impressed by their Temecula wine, we may have to revisit this area and see what they’re offering these days, 10 years later. Bill Hodge & Erin O’Neill-Hodge enjoy a good bottle of wine, visiting and enjoying wineries from Lake County to Orange County, from the Paso Robles Gold Coast to Gold Country and from Lodi to Bakersfield. This entry was posted in California Wineries - New World Wines, GSM, Lodi AVA - Home to 80 Wineries, Merlot, Paso Robles AVA, Petit Sirah, Sangiovese, Southern California, The Pleasures of Tasting Wine, Thoughts About Wine - Exploding Ruby Flowers On Your Palette, Zinfandel and tagged bottle of wine, california, chardonnay, paso, robles, tasting, wine, wine tasting room, winemaker, wineries, zinfandel.